Fueled by increasing economic linkages to China, Lao PDR and Vietnam, Udon Thani in NE Thailand is one of the fastest growing cities in the country. The urban area, which lies within an agglomeration of distinct municipal authorities, has ambitious plans for the future as an economic hub and gateway to the Mekong region, and is aiming to double in size and population in the coming decade. This growth has led to increasing concerns both about stressing the water supply and increased flood impacts. The city relies on a single source of water, the Huay Luang Reservoir. The reservoir’s original authorized purpose was for supplemental irrigation, but this has expanded to include municipal flood risk reduction, subsistence fishing, and flushing and dilution of downstream river contaminants. The reservoir operations are increasingly constrained, and increasingly the reservoir has begun the dry season with volumes at sub-optimal levels. 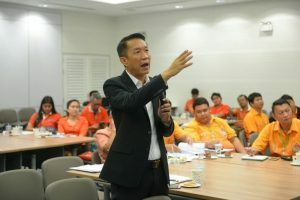 The difficulty in providing water during the dry season while managing increased flooding threaten the city’s strategic vision as an “economic hub” and “livable city”. Through an inter-municipal collaborative modelling process in a USAID project, ‘Building Resilient Asian Cities in the Mekong (MBRACE)’, participants evaluated how exceeding performance thresholds was much more sensitive to a combination of growth and climate stressors than to a single stressor. 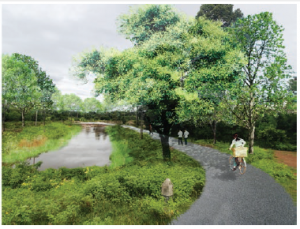 Stakeholders then identified an opportunity to use Thai city grants for recreation to develop parks and trails that connect, and protect and enhance canals and wetlands with a multi-purpose function of recreation and flood risk reduction. This proposal supports the mission of a livable city, buys down flood risk, and allows for potential updates of flood risk operations of Huay Luang reservoir to alleviate demand requirements and build water supply resilience. The robustness of this water resources management plan could be attained within existing resources and support the objective of sustainable urban growth as an economic hub. Moreover, it provided an expectation of improved real estate values. In the first figure, one can see illustrated the linkage of the various canals and wetlands for a recreation green space that provides flood risk reduction functions. 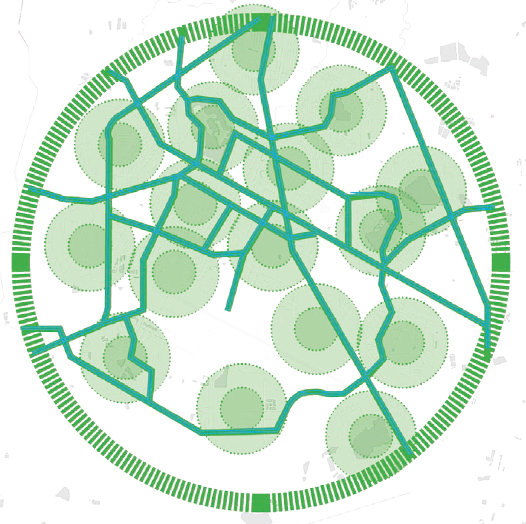 The system is bounded by a ring road that has existing storm water routing canals. The second figure illustrates an architectural rendering of one of the recreation / flood routing areas. Figures are a courtesy of estudioOCA, a landscape architecture firm. On 19 – 23 September 2016 a USACE team, Guillermo Mendoza (IWR) and John Kucharski (HEC), completed their engagement with the Udon Thani and its peri-urban areas to facilitate the development of inter-municipal green infrastructure strategy consisting of investments to buy down risk. Namely, where should activities be prioritized, to what extent, and who might be responsible for implementing them? The shared vision planning workshop was held with government officials representing the province, Udon city and key peri-urban areas, the relevant departments of public works, the chamber of commerce, the chamber of industry, and the royal irrigation department. The workshop had the objective of formalizing support for the development of an Udon Thani master plan based on conceptual renderings of green infrastructure informed by previous engagements, and develop master planning strategies through a serious gaming exercise which informs the decision making process and demonstrates how land use planning can balance future growth and urbanization against flood risks. Above, the mayor of Udon Thani facilitates discussion. Below, one of the shared vision planning model interfaces to allow negotiation between the various interests in locating and sizing green infrastructure to regulate, store, or route flood waters.